I've added one more song to my nursery song list (you can find my complete nursery list HERE). It's I Love to See the Temple. I just feel like this is a great song to get kids motivated to go to the temple - and why not start young right? 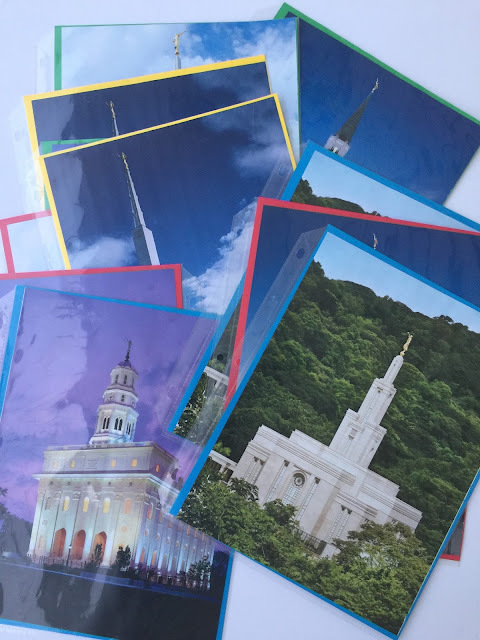 I found 6 pictures of temples in the Temples magazine and a few more I purchased at the Distribution Center so now I have 12. I picked the ones that would fit nicely in 8 x 10 plastic sheet protectors. Then I placed black card stock behind them for some support and to hide the other side and taped the top closed with packing tape. I have the kids hold them while we sing the song and we sing this one very first every week.